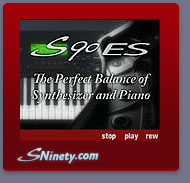 The S90 ES was released in September 2005 and is to the Motif ES as the S90 is to the original Motif. This means that the S90 ES version has all the sonic power plus of a Motif ES, but withholds the sampling and sequencing capabilities. The ‘plus’ is unquestionably the most refined and authentic acoustic piano voices ever offered on a digital keyboard. Comprising no less than 53 MB of brand new, multi-sampled stereo samples, the new pianos also make use of the ES’s new damper reverb effects and half-damper pedal capability. Polyphony has been increased from 64 to 128-voice, and internal effects processing has been enhanced with eight Insert effects, two System effects, and a separate Mastering effects processor. The S90 ES offers more than 500 preset Voices; along with 65 drum kits, and a 256-slot user memory bank. 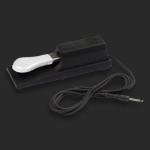 Custom voice banks that have been created for the original S90 are generally also available for the ES. There is no SmartMedia slot, but .MIDs can be harnessed and played back direct from USB storage media. If you want to add even more power, not only has full PLG expandability been retained, but you can also tap into the world of Yamaha’s Studio Connections editors and other computer applications. This video requires the Macromedia Flash plug-in and a broadband connection.